This past Saturday, Matthew and I ran one of my favorite races of the year, the Sole of the City 10k race in Baltimore, MD. The 10k is probably my favorite distance to race but it isn't very popular- so that's why I love this race so much; it's rare AND awesome. Last year, I didn't have the best time with this race. It was hot, hilly, and I had some awful stomach cramps. We also got there so late (due to a crappy parking debacle) that they were already singing the national anthem. Anxious and flustered is not how I like to start a race. This year, we left the house at 6:30 am for a 9:00 am start time. We were determined not to get caught up in traffic :-) We parked literally right around the corner from the finish around 7:30 am. Luckily, my former roommate/best friend Kelly met us there so we spent the next hour and a half catching up- it was awesome! Around 8:45, we headed to the start line. With 4,500 runners, it was pretty crowded. 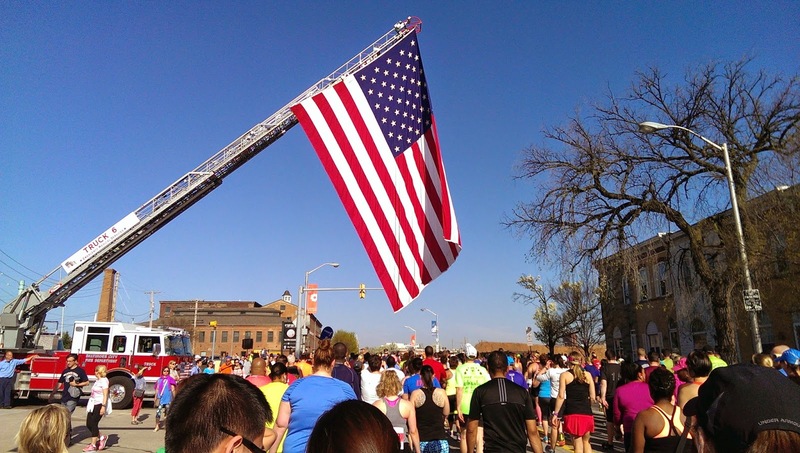 Same as the last two years, we started under a ginormous American flag- so cool. I can't imagine a better start than this. It was a beautiful day for a run. Clear skies and temps in the mid to upper 60's. Since I've been struggling with ankle and toe pain, I just wanted to enjoy the race and finish with a smile. I kept my intervals to 1:1 and focused on good form, keeping a close eye on how my feet were feeling. 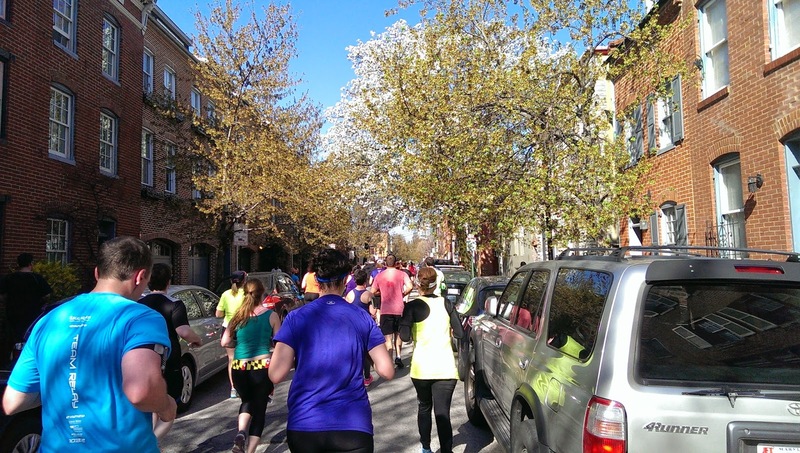 Just like last year's course, we ran through three miles of Baltimore neighborhoods then turned back and ran along the Inner Harbor for the last three miles- including some major hills. But unlike last year's course, I felt amazingly strong throughout this race. Every hill I saw, I conquered, passing lots of people as I charged forward. "Not this year, not today." I kept repeating those words, out loud (which I'm sure made folks think I was crazy! ), all through the race. I was determined to have a better race and a better time on the clock than the last two years (2014- 1:14:55, 2013- 1:14:19). On the left, my favorite museum in Baltimore: the AVAM aka the American Visionary Art Museum. Seriously, I love running in this city. After the final hill (which felt a hell of a lot better this year! ), the course started it's long descent towards the finish. I kept checking my phone and knew that I was going to be close to a PR for this course. I gave it one last push and got across the finish line at 1:11:00. A full four minutes faster than last year! And I felt great! The best part about this race? I mean besides the amazing Under Armour premium, fun course, and awesome finish line party? Free beer! This year they had the standard Miller Lite AND Summer Shandy! What an awesome surprise! After getting my sweet free beer, I met up with Jes from Runs and Crafts. 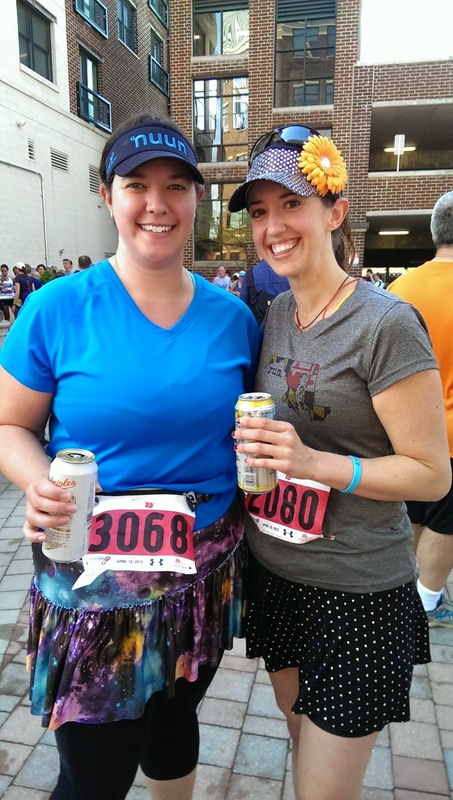 We talked all about Baltimore running, team sparkle skirts, and runDisney races. I hope we run into each other at other races this summer! 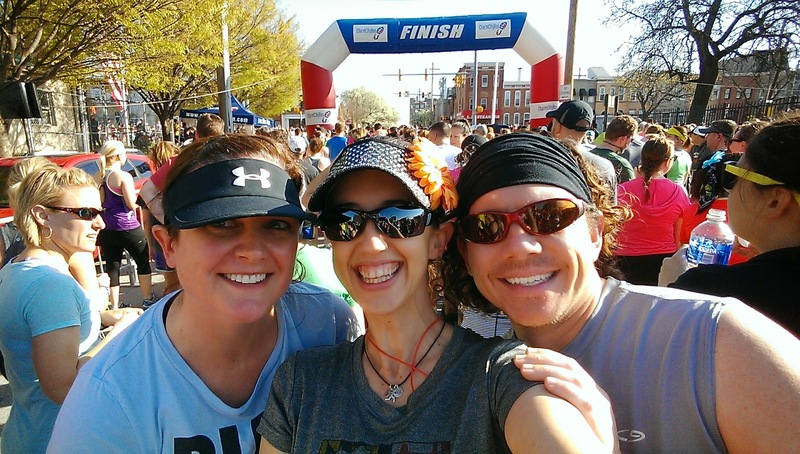 Other highlights of this race included seeing a few high school friends on course, a random lady bug landing on my arm around mile five, and seeing a bunch of people dressed in full-on pirate costumes at the Inner Harbor. I wish I snapped a picture! Matthew and I got our free food- bananas, granola bars, and wraps- and headed back to the car. This year parking was a breeze and we were on our way home in minutes. 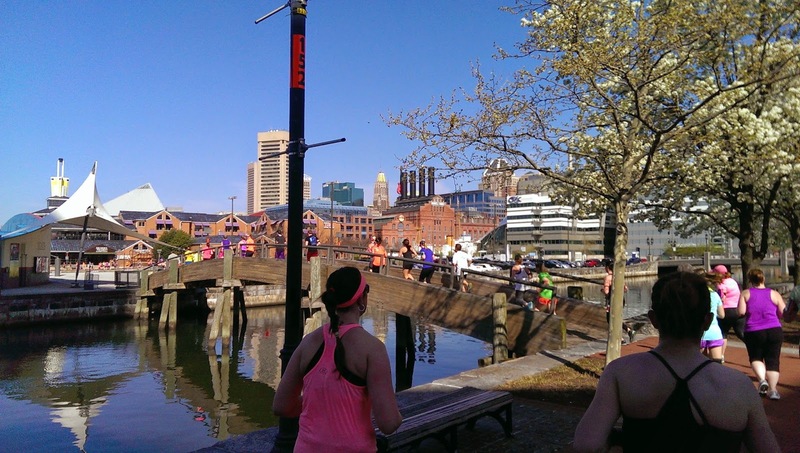 Overall, this was another wonderful race put on my Charm City Run. My only complaint is the lack of water stops, similar to last year. Again this year, it was sunny and warm and we could have used more than two water stops on a six mile course. Other than that, this race gets an A+ from me! 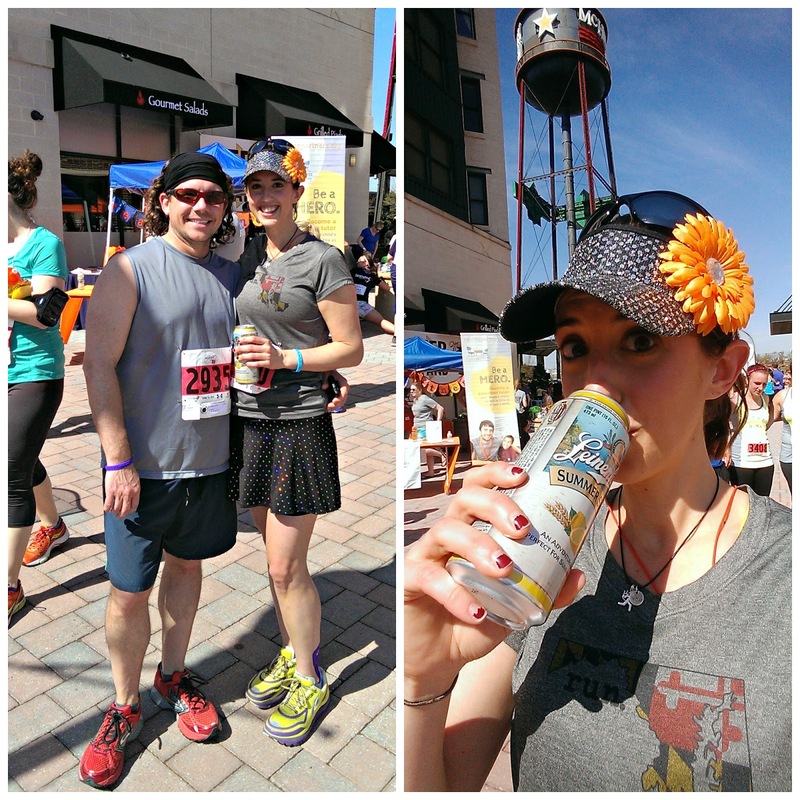 Summer Shandy is Sparkly Runner approved! What's the best finish line treat you've received at a race? I'm not going to lie, I was sorta nervous for the race this year as I remembered struggling with those major hills last year. But, this year, not so bad at all! Maybe it was because I knew what to expect from the course so I could pace myself appropriate. Oh, and that Summer Shandy at the end? Total expected surprise! Loved it at the end of a warm race. However, they really do need to fix the water situation for this course. The past 2 years have been quite warm and more water would be nice. Congrats on your 4 minute course PR. That is great Sarah, especially after what you went through this winter. Water stops need to be more frequent if the weather is hot. 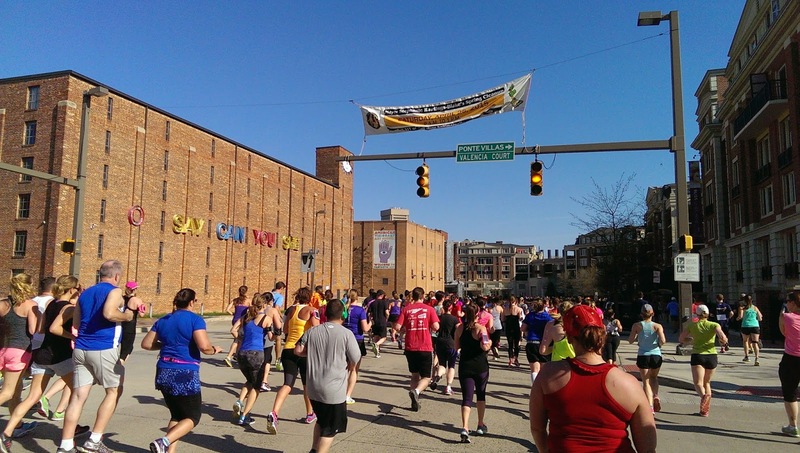 Perhaps this race ends up being unseasonably warm each year?